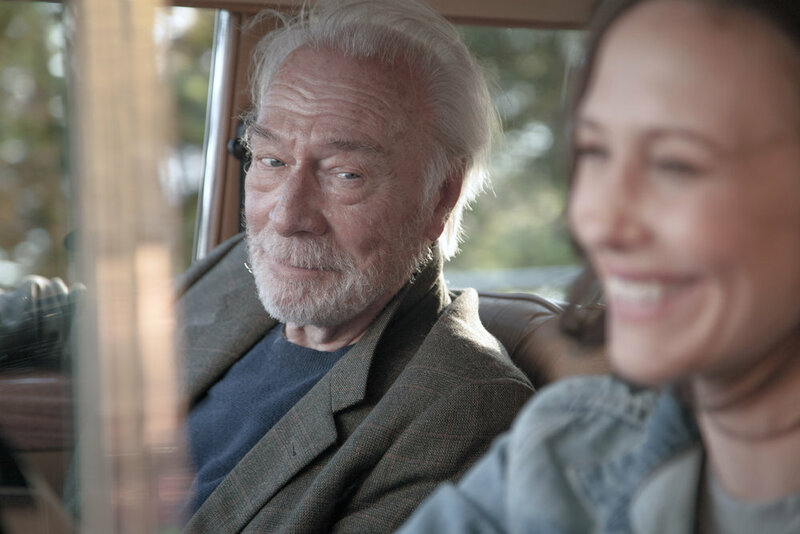 Chrstopher Plummer and Vera Farmiga star in "Boundaries," in which a man with a shady past reunites with a family he never knew on a West Coast road trip. SHE: One of the first things that caught my eye was that there was a rosary hanging from the mirror in the lead character’s (Laura, played by Vera Farmiga) car. So you’d think she was someone who had a moral compass. And I think the movie proved that she did. The journey to prove this was a little bit bizarre. HE: Laura was no saint, rosary or no. Nobody in the movie was. I didn’t catch the rosary, actually. There were some name actors who were better than their material (script by Shana Feste, who also directed). Christopher Plummer played the flawed family patriarch, Jack, and it’s too bad the movie was so mediocre because otherwise he might’ve had a chance at becoming the oldest Oscar-winning actor ever. SHE: I thought Laura had a pretty hard row to hoe with a son who drew unposed naked pictures of people he knew, including the school principal—one of the many infractions that led to his ouster from the school. HE: There’s reference to this surly kid’s taking photographs of dead animals and his favorite word seems to be “douche.” The actor (Lewis MacDougall) did a good enough job with him, but I didn’t care much for the character, Henry. And his grandfather (Plummer) was unprintably vulgar in addressing the kid and the kid’s mother (Farmiga) … which I also didn’t like. The age-old journey story is a device capable of keeping an audience’s attention, which is why it’s age-old, but this one didn’t strike me as particularly inventive or surprising. SHE: Oh, and we forgot to mention that on the trip to take Grandfather (Laura’s dad) from Seattle to live with Laura’s sister in Los Angeles there were several pets in the car. It seems Laura has a soft spot for animals, which might be why she agreed to take her dad on this trip. He got booted out of the senior home he was living in. And that’s another thing—Jack was growing all this marijuana in a senior home greenhouse and nobody noticed! HE: The old guy uses his daughter as a drug mule, loading her car trunk with pot and visiting customers along the way to L.A. He enlists the kid as his business partner. Daughter Laura for the longest time is blind to the whole business. Occasionally there’s a funny line, as when Jack quips that the inside of the car “smells like a Grateful Dead concert.” But it’s not a very laughable, or admirable, picture. I guess one of the problems was there just wasn’t anybody to relate to. Well, maybe Henry’s mom who, despite having a lousy childhood and a dysfunctional family, has a decent job and is doing her best in raising her son. HE: She hasn’t taught him much about functioning in society, though. He’s apparently friendless and a screwup in school. And a smartmouth. SHE: True enough. It was fun watching the hippie dad/grandpa and his hippie friends (Christopher Lloyd, Peter Fonda), although well into seniorhood the pothead mentality struck a discordant note. HE: So you liked “Boundaries”—or you didn’t? SHE: Generally, no. I guess about halfway through their journey I didn’t care that much about anybody. You kind of knew something dramatic wasn’t going to happen. I guess I see the point that everyone’s a bit of a misfit. HE: It shouldn’t have taken nearly two hours to make that point. The story of disconnected relatives coming together, or dysfunctional relatives starting to function, could’ve been told more responsibly, more interestingly, more with a general audience in mind. I’d grade it C-. SHE: I’d give it a C. It wasn’t meant to be a family movie. HE: Trouble is, I’m not sure what constituency it was supposed to be serving. SHE: Except maybe the pot growers of the West Coast.